You can see it all over our map of graduation rates by district: a pocket of low graduation rates surrounded by higher ones, indicating a city and its surrounding suburbs. It should come as no surprise that urban districts tend to have lower graduation rates than suburban ones. They often have more disadvantaged students and fewer resources. This week, I thought we’d take a closer look at some of the nation’s largest metro areas to see how similar — and different — they are. First up: Philadelphia, where the divide between urban struggles and suburban successes is clear. Philadelphia is that huge dark green district. It had a graduation rate of 70.1 percent in 2013. Right across the river in New Jersey, the neighboring dark green district is Camden, with a 53 percent graduation rate. You can see that while some nearby districts in New Jersey still don’t hit the 85 percent graduation rate mark, nearly all places surrounding these two perform better. The districts immediately west of Philadelphia perform much better. These districts are predominantly white and wealthy, according to Marybeth Gasman, professor of higher education at the University of Pennsylvania and director of the Penn Center for Minority Serving Institutions. She attributes part of the difference to the fact that Philadelphia schools have been “starved for money” in recent years, while the suburbs have a large tax base. Contrast this with Chicago, where increases in graduation rates grow somewhat gradually the farther you get from city limits. Again, the large dark green district is Chicago Public Schools, with a 2013 graduation rate of 69.7 percent. Notice how there are blocks of high-performing suburban schools with graduation rates above 95 percent in all directions; they’re just not directly next to Chicago. And there are far more districts with low graduation rates surrounding the city. The suburbs to the south of the city, for example, are populated by low-income families who left Chicago in the 2000s, when the city tore down high-rise public housing and replaced it with mixed income housing, said Elaine Allensworth, director of the Consortium on Chicago School Research. Related:Â What’s behind the Deep South’s low high school graduation rates? For yet another example of what this urban/suburban divide can look like, consider the Bay Area. Once more, we see higher graduation rates outside of the cities, but this scenario is a little more complex. 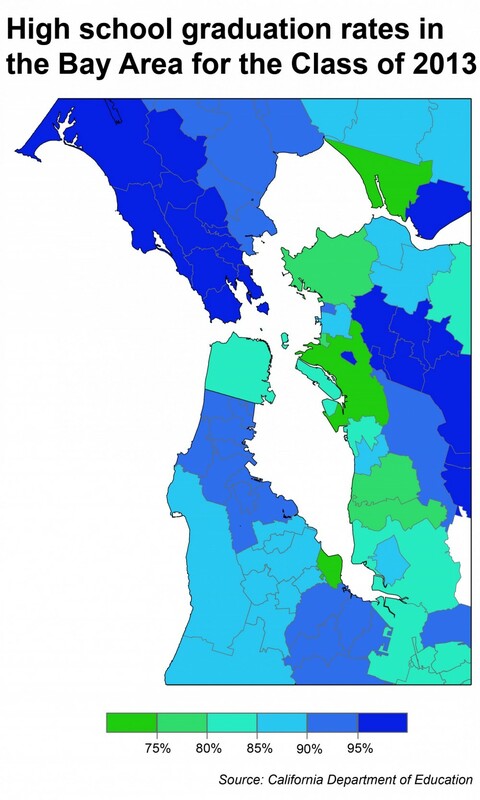 For starters, there’s the difference between San Francisco and Oakland, which is the poorer of the two cities. Some nearby districts have graduation rates that are better than than Oakland but still lower than San Francisco. There’s also somewhat of a similar phenomenon as in Chicago, but without the gradual transitions. Directly south of San Francisco lays a cluster of districts with graduation rates between 90 and 95 percent. To the north, there’s a group of districts that all graduated more than 95 percent of students. Once more, the graduation rates reflect the socioeconomics of the area, said Thomas Dee, a professor at Stanford’s Graduate School of Education. For instance, that dark blue pocket north of San Francisco of full of districts that tend to be less populated and more affluent. “There’s sharp residential segregation by race, by poverty,” he said. So what does all this mean? Metro areas take shape differently, but consistently housing patterns and economics determine the educational destinies of their residents. I would love to find a major city school district graduating more students than its suburban counterparts because of academic excellence. For now the only city I can find outperforming its suburbs is El Paso, Texas, and there it’s because the suburbs are performing poorly. It appears that the loftier goal eludes the nation.